This is the perfect present for any DIY experts in your life! It’s a really useful credit card tool with multiple uses including bottle opener, screwdriver, ruler, saw blade and more. A creative way for displaying photos around the home! Whether they’re polaroids or just regular sized photos, this is perfect for sharing those precious memories. This sock trio adds a splash of colour to any outfit and with three pairs to choose from, that’s three outfits to be jazzed up! And let’s face it, no one can ever have enough pairs of socks. For that special someone who enjoys a nice, chilled alcoholic (or non alcoholic!) beverage. The wedge keeps drinks chilled to perfection and this glass is meant to be slow melting as well so that icy temperature can be savoured for longer. Because beauty lovers can be guys too! This Korres bergamot set comes with shower gel, body moisturiser and lip balm – all the essentials! Perfect for the bathroom at home or the holiday wash bag. A great little gadget for finding keys or even a mobile! Keys and phones are easily misplaced and there’s nothing more stressful than when you’re heading out the door and you can’t find them! This is a thoughtful gift for making sure your loved one doesn’t lose those essentials again. These headphones come in a range of colours but this gorgeous green pair with gold hardware are pretty special. They’re in ear headphones with noise cancelling functionality so the music can be enjoyed in peace. 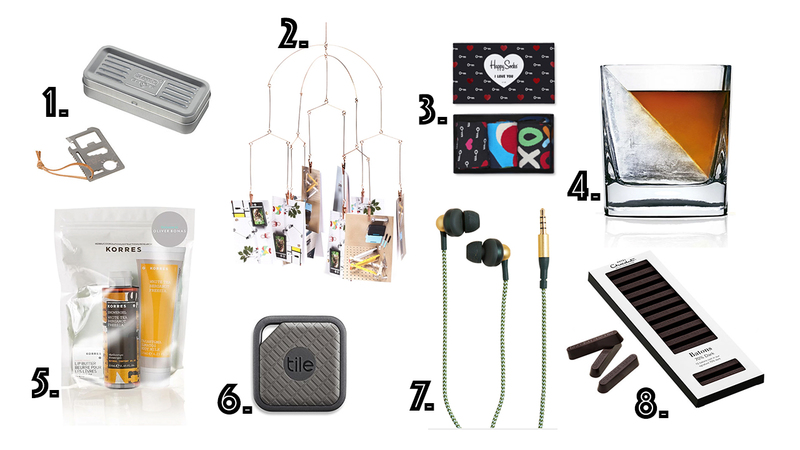 And that’s it for my Valentine’s Day Gift Guide For Him! What do you plan to get your favourite guy for Valentine’s Day this year?